Apple has launched “Piano”, a television commercial promoting the new iPad Mini. 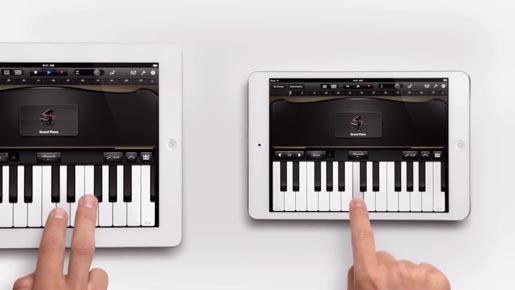 An new iPad and an iPad Mini play a piano duet of the 1938 song Heart and Soul on Garageband, the larger iPad with two fingers, the iPad Mini with one finger. The commercial follows on from the iPad Mini Smart Cover ad, featuring the Lupine Waltz, and 4:45 minute iPad Mini Intro video. The Piano ad was developed at TBWA\Media Arts Lab by chief creative officer Duncan Milner, executive creative director Eric Grunbaum, creative directors Simon Cassels and Jon Lancaric, art director Luke Martin, copywriter Chris Trumbull, executive producer Mike Refuerzo, agency producers Hank Zakroff, Mallory Gordon, Tessa Kocourek, Christina Villaflor. Editor was Jenny Mogen at Nomad. Post production was done at D-Train by lead Flame artist Ben Gibbs.